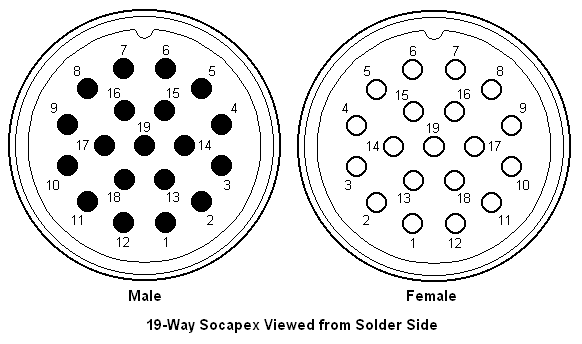 Socapex are a type of electrical connectors, known in the entertainment industry primarily for 19-pin electrical connectors. The Socapex was first created by a company called Socapex in 1961, but the term is now often applied to similar off-brand connectors as a genericized trademark, like Showsafe. The circular connectors are used in film, television, and stage lighting to terminate the ends of a multi-cable. They are wired with six live pins, six neutral pins, six ground/earth pins, and a final central pin used to aid alignment of the male end of the connector with a female receptacle. Read more about what Socapex Connectors are here. 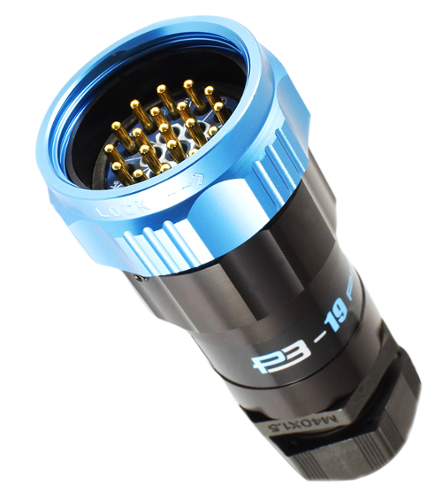 Available in variety of sizes, the most common being 19-pin circular connectors used for lighting applications. The connectors push together and are secured with a locking ring. Cable mounting and chassis mounting types are available in both source (male) and drain (female) forms. The 19-pin lighting connector can carry 6 individual circuits at mains voltage with no common neutral or earth connections. Unlike other connectors all circuits are independent, so can be on different equipment or phases, see the socapex diagram. Pin 19 is unused, or connected to the cable screen in a few rare cases. It is generally thought to be a good idea to common the earth conductors (pins 13 to 18) inside each connector, however this is not permitted in the US. Care should be taken to ensure the connector cover is earthed if metal. Often 19-way cables used in theatres are terminated in ‘spiders’ and some plugs on the ‘spider’ may be left unconnected. If ‘spiders’ are used it is best to ensure all plugs are connected even if not used. Special socapex cable is used in the lighting world to carry 6 circuits of power inside 1 multipin cable. The Showsafe connector features 19 pins, an all-metal exterior and locking threads to keep the lines together. When using individual lights, you can use a fan out, also known as a break out. This cord takes the end and turns it into 6 circuits of Edison, Stage Pin, or L620. 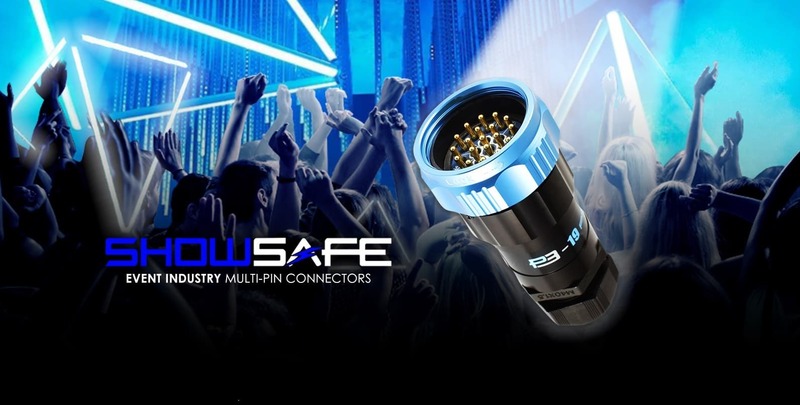 Phase 3’s Showsafe range of UL approved multi-pin circular connectors have been developed to deliver the highest levels of reliability and safety. Available in 3, 5, 7 and 19 pin connectors for the events industry. The super robust construction of the circular connectors ensures reliable operation. The rugged design has been tailored specifically for professional touring & stage lighting applications and all connectors are fully socapex compatible. What are the UK Old & New Wiring Colours?